Even as Jiang Chen flexed his muscles in preparation for battle, an irregularity arose in the seventh wave. A genius named Sunyu Xiaosheng stayed a full five hours inside the formation. It broke Chu Jianhuan’s previous record in one fell swoop! The result sent ripples of shock all through the Pagoda’s surroundings. Sunyu Xiaosheng replaced Chu Jianhuan as the hottest piece of news. He’d stayed in the formation for three more quarter-hours than Chu Jianhuan had. Anyone who’d been in a formation before knew that it was increasingly more difficult to resist the longer one stayed. These three quarter-hours showed a clear edge in both strength and formation-resisting ability. Jiang Chen smiled faintly, refraining from giving a concrete response. He clearly understood that compared to his pill talent, extolled as the best in Veluriyam, his martial talent wasn’t known by nearly as many in the city. A fair few knew that he’d received a reward from Emperor Peafowl back at Sacred Peafowl Mountain. But since that time, nobody had actually seen his performance with their own eyes. Many suspected that the emperor had intentionally given Jiang Chen a treat and that it hadn’t been entirely meritorious. Though Ji San didn’t particularly believe these rumors, he nevertheless didn’t have nearly as much faith in Jiang Chen’s martial ability as he did his brother’s pill ability. After all, the level of martial expertise that Jiang Chen had showed was still a ways off from geniuses who were nearer to the pinnacle. Yes, Jiang Chen had broken through to seventh level sky sage realm, but Ji San had been at ninth level sage realm for a long time already. There wasn’t any top-ranked genius in the great clans at a lower cultivation level than that. The top geniuses of the great clans were all at ninth level sage realm. As for the young lords closest to the emperors, many were already halfway to emperor realm; some had even reached it already. In the martial world, such differences were marked. Ji San’s words to his brother, therefore, meant absolutely no ridicule. In separate secret rooms within the Veluriyam Pagoda, all seven great emperors and their retinues were attentively focused on the selection process. It was simple on the surface, but every emperor assigned significant importance to this round in particular. No matter what level of genius one was at, it would be reflected accurately in this process. For example, the Chu Jianhuan from before was held in high esteem by several emperors. When Sunyu Xiaosheng appeared, no emperor apart from Peafowl could keep their calm. Even Emperor Shura was greatly astonished, instructing his Moon Monarch to keep close tabs on this particular genius. If the kid could make it into the two-hundred-strong Genius Rankings, then he absolutely had a place under Emperor Shura’s banner. Emperor Shura’s faction had collected many geniuses over the years. Not every genius could achieve individual prominence in maturity, but that was no obstacle to the practice. More geniuses meant more that would be able to last to maturity. Lin Yanyu’s first place result amongst the Pill Pagoda battles’ wandering cultivators made him a primary target for Emperor Shura’s recruitment. Unfortunately, it only resulted in double the disappointment. Not only had their efforts in recruiting Lin Yanyu proven ineffective, but they’d lost their very own Pill King Bu in the process as well. The most upsetting thing about it was that Pill King Zhen had been the person to win both of them over. He was virtually best buds with Sacred Peafowl Mountain. According to rumors, Emperor Peafowl had plans to make heavy use of Pill King Zhen. There were other rumors that if the pill king showed an excellent performance at the Martial Pagoda battles, Emperor Peafowl would possibly make him Sacred Peafowl Mountain’s next young lord. The news hadn’t spread externally, but it had certainly made the rounds internally amongst the seven emperors. Though everything was still yet unknown, the other titled emperors’ keen instincts told them that the well-timed comments were far from baseless. A sliver of coldness flickered across Emperor Shura’s eyes. Evidently, he found the previous events quite unpleasant, even shameful to an extent. “Which wave is that Pill King Zhen in? Has he not passed the first round yet?” He didn’t know why, but the emperor had become a bit wary towards this Pill King Zhen. “We’ll see shortly,” Moon Monarch harrumphed. “Still, what is Emperor Peafowl really playing at?” Despite his years of experience interacting with his fellow emperor, Emperor Shura still couldn’t see the intentions behind the gesture. Was it a smokescreen, or was it to test him? Yes, that was true in theory, but Emperor Shura wasn’t convinced. He had always tightly controlled himself in front of Emperor Peafowl, lest the latter build up a dislike for him. Only then would it be possible for him to justifiably inherit Veluriyam Capital and thereby become its actual leader. However, Emperor Peafowl had never clearly expressed any inclination towards such a plan. It was soul-crushing for Emperor Shura. In recent years, these negative emotions had become sharp edges, perpetually showing themselves and cutting against Sacred Peafowl Mountain. Still, he knew as well as anyone that as long as Emperor Peafowl remained, all of his machinations had to remain as ambition alone and could not be carried out concretely. The past several thousand years had been Emperor Peafowl’s era. As long as the emperor still remained, the years accounted to his period would stretch on and on. “Your Majesty, that kid has entered the formation. I see him now,” Moon Monarch advised. Emperor Shura’s eyes moved towards the center of the formation. He was able to find the pill king very quickly. He was the young man who had stirred up so many storms in the city lately. That young man was like an unsolved riddle. The emperor had guessed endlessly at Pill King Zhen’s identity during his idle hours. He’d crafted many hypotheses, but none of their accompanying conclusions satisfied him. He had even suspected the pill king to be Emperor Peafowl’s illegitimate child… for a time. But there was no tangible proof for such an absurd conjecture. Moreover, the kid’s pill talent wasn’t something that Emperor Peafowl could instill. Emperor Shura didn’t put much stock in calling this Pill King Zhen merely Emperor Peafowl’s game piece. This was because the pill king’s strength was greater than the other emperor could possibly cultivate. This was a little excessive. There hadn’t been a single two-hour survivor in the first three waves. Were geniuses better and more numerous in the later waves? Of course, one couldn’t rule out the possibility that the first few waves’ entrants were keeping their strength in reserve or hiding it outright, really. In fact, the possibility was quite high. Nobody had known the finer details of the round at first. Passing, and thereby guaranteeing moving onto the next round, had been enough. This wasn’t the case for the later waves. With more and more geniuses displaying their radiance, the conflict beneath the table grew white-hot. It was normal for better and better results to continually surface. “There’s three left still after three hours. Tch, will there be a heaven-defying genius appearing in this eighteenth wave?” Moon Monarch’s eyes were half-shut, his tone perplexed. Most importantly, Pill King Zhen—who was the object of their scrutiny—had still not departed. To add insult to injury, there was no sign from the pill king’s expression that he was struggling at all. It wasn’t just Emperor Shura who was captivated by Jiang Chen—he was the talk of the town with the other emperors as well. Because of his status as the foremost in pill dao, it was difficult for Pill King Zhen to stay under the radar. The seven emperors, the other contestants, and even the various factions... all had only one question on their minds—how long could Pill King Zhen stay in the formation? Today's a triple release day because etvo fell asleep last night! 11th chapter of the month! 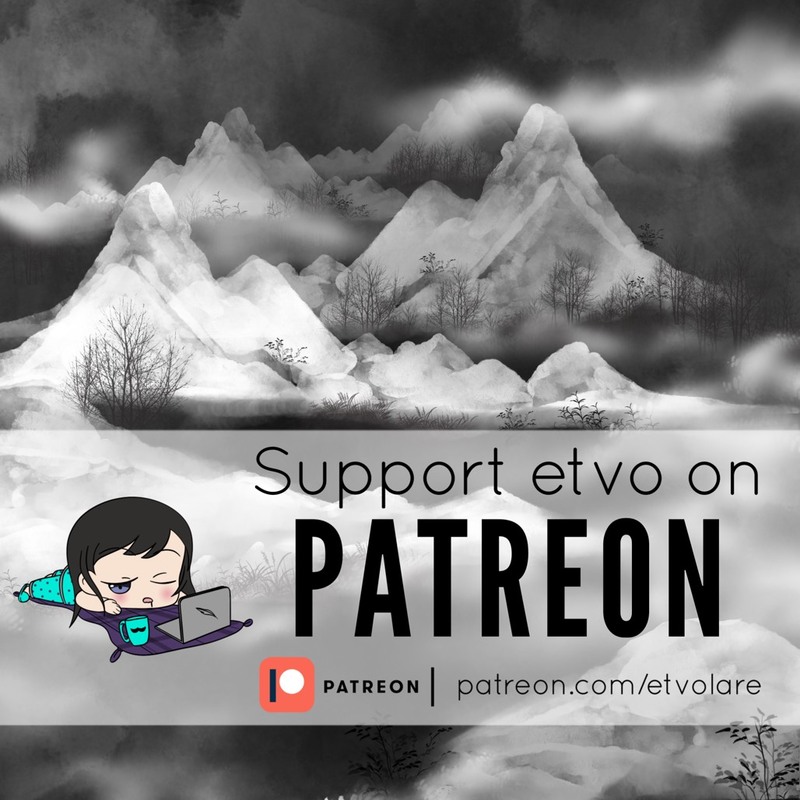 Moar on Patreon!